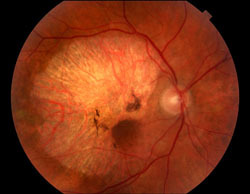 image showing geographic atrophy (GA). The results highlight the benefit of the use of a neurotrophic factor to treat GA and provide hope to nearly one million Americans suffering from GA. The ECT utilized a capsule that contains genetically engineered cells to continuously produce CNTF over a 12-month period. The CNTF-secreting capsule was implanted in the back of the study subject’s eye. The implant allows the CNTF molecules to diffuse into the eye tissue, while keeping out antibodies and immune cells that would attack and destroy the CNTF-producing cells. Zhang’s research is supported by the National Eye Institute, National Institutes of Health; the Macula Vision Research Foundation; Burroughs Wellcome Fund; Research to Prevent Blindness, Lew Wasserman Merit Award and Senior Investigator Award; and the Chinese National 985 Project to Sichuan University and West China Hospital.